I recently had the pleasure of watching all four Terminator movies for the first time with a handful of friends. The story is very stimulating and the theme of salvation runs deep throughout the quartet. Beside the very interesting interplay depicted between destiny (the Sovereignty of God) and man’s responsibility and ‘free will’ in determining history, I found the Terminator’s singleness of purpose very thought-provoking. 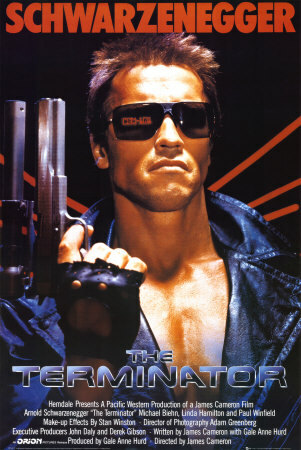 In the first movie, the Terminator is sent back by Skynet to destroy Sarah Conner, and he will stop at NOTHING to achieve what he was made to do. In the second movie the Terminator is reprogrammed by the future John Conner to go back in time and protect the present John Conner. This the Terminator carries this out with unwavering focus, in spite of having to sacrifice himself in the end. In the third movie the Terminator again sticks to its mission, even after being reprogrammed to kill John and Kate, it manages to override that programming to shut itself down. And in the fourth and final movie Marcus (part man, part machine) helps to take down Skynet once and for all, in the end sacrificing himself to save John. There was once a real man who walked this earth with such a focus. Jesus Christ, who laid aside the glory of heaven, put on human flesh, lived among us and laid down his life for those he loves to save them from certain destruction. Oh how I long for such a singleness of purpose in living a life wholly devoted to serving God in all that I do!